A secondary character can be a trusty sidekick. Or the quiet, mouse-like kid that needs protection. Or the bossy, bullying one that always seems to be listening in on the heroine’s plans. My secondary characters always seem to be full of personality. So much that they often threaten to steal the scenes away from my main character. And there’s my problem. Why is it that the main character is so much harder to bring to life than a secondary character? You can start thinking about the main and secondary characters in the same way. They have strengths and flaws, personality traits, physical appearance, etc. But there’s a lot more pressure on a writer to create an engaging main character. While the main character has to change and grow throughout the story, the secondary characters can just hang out and have fun, appear when they’re needed and disappear when their bit is over. In a compelling story, the main character cares about something so much he or she will do anything to have it, and writer has to convince the reader that the wanting it is worth it. Secondary characters can care about it too, but it’s not like their world will end if they don’t have it. One of the strategies for writing a compelling main character is to try to put yourself in the main character’s shoes. Oddly, what this helps me with is bringing to life my secondary characters. In real life, I’m always making observations about other people—their mannerisms, their emotions, their choices. When I create secondary characters, these details emerge naturally in my writing. But when I’m standing in the main character’s shoes, I have to turn that same lens on myself. Analyze my own (or my main character’s) strengths and weaknesses. It’s so much harder. Especially since that main character is not quite me, but some made up version that is part me/part the-heroine-I’d-like-to-be/part the-person-whose-flaws-create-the-most-conflict. The part that is me doesn’t really like probing into the sensitive stuff that I’d normally cover up so I don’t have to deal with it. The heroine part wants to…well, be a hero. She doesn’t want to think about her flaws and bad choices. And the flawed part of the character would rather not remind anyone of her shortcomings, even if they do help to create a good story. All this makes it so difficult for me to create a main character that really comes alive for the reader. 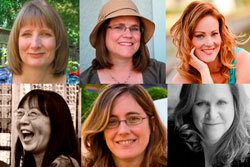 What do you think is your biggest challenge in breathing life into your main character? Do you find it harder to create your main character or your secondary characters? Yesterday I got my sixth tattoo. It was a coverup up of something I wasn’t happy with and didn’t really fit my personality anymore. I waited a long time to have it done and saved for months to afford it. It’s the biggest one I have and so - no surprise - it took the longest time to get done. That wall is a tough thing to break through. Like with my tattoo, I usually just grit my teeth, try not to scream out obscenities and concentrate on the end result. What about you? How do you push through that wall? How do you find your second wind? 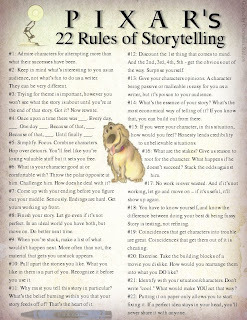 There is a graphic representation of Pixar's Rules of Storytelling going around "teh Intertubes," courtesy of Beau Chavassus, which I will insert here and hope you can enlarge it. These supposed rules were created for screenplay writing, but I think some of them are immensely important for novel writing. My alter ego (no, actually just me, editing as www.fallingforwords.com) reads manuscript submissions for Rhemalda Publishing. I can tell you which rules took me years to understand, and now as a reader bother me the most. I can sum up rules 1, 4, 6, 13, 16, and especially 21 with one phrase: I have to care about what happens to your main character before you put him or her in mortal danger. Writers are often told to start with action. This is early writing advice, to get you past beginnings on the first day of school, as someone wakes up, staring into a mirror, recounting family history, etc. But you can't swing too far on the pendulum. Start me off with a plane crash where only your main character survives, and I'll mourn the dead. Start me off with your main character's actual life (with movement toward goals, which may be a better term than action) and then I might care more about him or her than the other passengers on the plane. I would say don't start with Michael Bay, exploding things action (unless you're writing Transformers 7). Start with forward momentum. Start with building tension. Start with Harry Potter trying to get out of the cupboard under the stairs, Mrs. Frisbee feeling her son's forehead for fever, the rabbits in Watership Down staring at a man-made sign and wondering what it foretells. Then move to Hagrid's Apparition, Mrs. Frisbee's desperate appeal to Rats of NIMH, and the bulldozers destroying the rabbit warrens. Analyze the beginnings of your favorite novels and movies. There's a very good reason FINDING NEMO doesn't open with Nemo's disappearance. 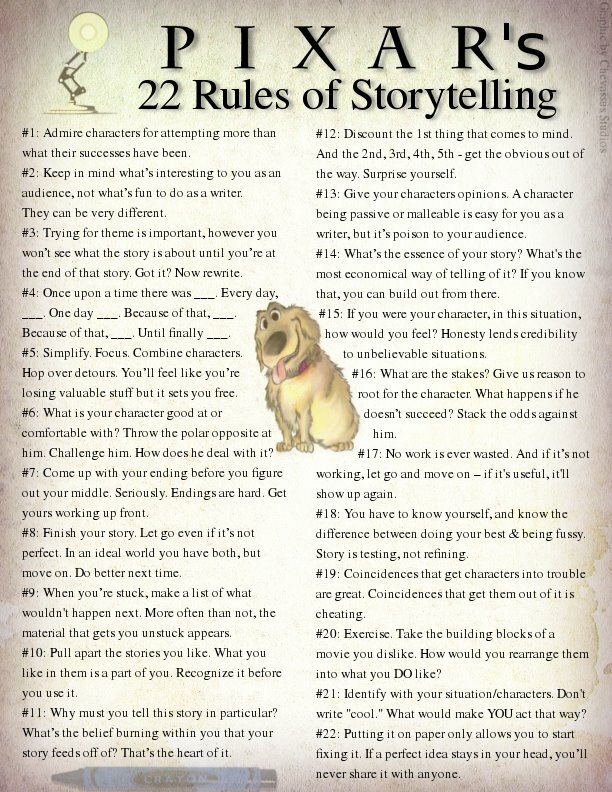 I'm not sure if these are actually Pixar's rules, but they're great guidelines anyway. Once upon a time, _____. Every day, _____. Then one day, _____. Don't skip the "Every day" part. As I've heard it phrased before, tell me what makes your main character different from everyone else. That's the first question that should be answered, in my opinion. I hate first drafts. HATE them! They are slow and torturous and overwhelming. But today, as I was staring at the screen waiting for inspiration writing, I got to thinking about an exercise I sometimes do with students when I’m talking about revision. They usually comply, though, and end up happily rolling and pinching and creating. Then I explain that this is what revision is - just playing with what you’ve already got. Maybe you make something altogether new or maybe you just make something better. On a good day, I get plenty of “Aha!” moments. It’s awesome. I love revision. But here’s the problem though - you can’t revise without “something” to work with. So I’ve decided to start thinking of first drafts as nothing more than making clay. Since I’ve written a bunch of craft books, I know a thing or two about making clay. Mixing up clay can be consuming and not always an exact science. (Especially if you’re making up a new recipe!) Sometimes you add a little of this but then find you need a little more of that. You get gunk all over your work space and yourself. And Heaven help you if you have an itch or the phone rings! But isn’t it also wonderful to put your hands in the bowl and get them all dirty and squish the wet stuff between your fingers? And isn’t it fun to think about all the things you’re going to make? Or commiserate with someone nearby while the two of you are both elbow deep in a mess? Isn’t it satisfying when you look down and realize that the clay is perfect and ready for molding? And that while your hands are tired, it’s a good kind of tired? Isn't it awesome to share your clay with friends? Yeah. All that stuff is pretty darn cool, too. So tomorrow when I open the file on my WIP, I won’t be writing a first draft: I’ll be making some clay.